Every year, the Christmas spirit moves into Knott’s helping create Knott’s Merry Farm! A incredible experience every year, Knott’s helps make family memories for the Holidays. Underneath is all the info you need to know about Knott’s Merry Farm this year! Joy is in Season again at Knott’s. 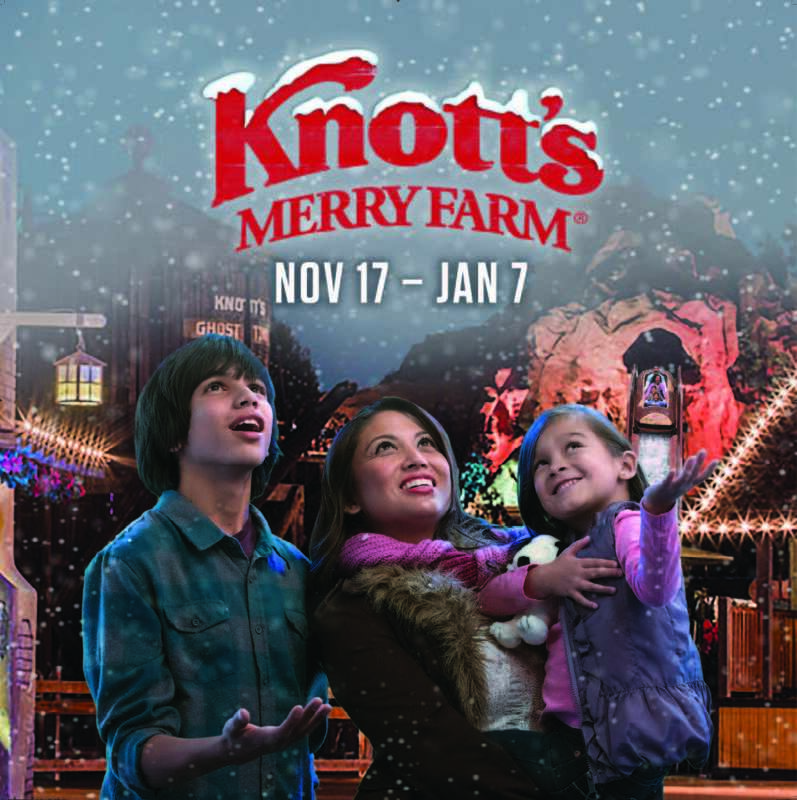 From November 17 through January 7, Knott’s Merry Farm provides the perfect backdrop for your family’s holiday memories with a park transformation that surrounds you with the glorious sights, sounds and scents of the season. Guests of all ages can enjoy classic shows like Merry Christmas, Snoopy!, the festive ice show. Stroll through the merry streets of Calico for unique seasonal treats that can’t be found anywhere else, traditional live Christmas Carolers, a Christmas Crafts Village offering unique and personalized gift ideas, Santa’s Christmas Cabin, the enchanting Snow and Glow show with nightly falling snow set to thousands of sparkling lights and traditional Christmas music, plus so much more. Charming holiday shows remain at the core of the Knott’s Merry Farm experience and continue to delight. Audiences can dance and sing along to the live performance of It’s The Merriest Christmas Show Ever, Charlie Brown at the Calico Mine Stage. The Peanuts Gang star in this toe-tapping, merry musical sure to bring out the Christmas joy in all. Select dates, November 17, 2017 – January 7, 2018. The seasonal live entertainment continues with special showings of the breathtaking ice show, Merry Christmas, Snoopy! starring the Peanuts Gang and a cast of world-class ice skaters. In this whimsical show, Snoopy enjoys all of the best parts of the season including trimming the Christmas tree, awaiting Santa’s arrival, and attending the Christmas Ball! Showing select dates, November 17, 2017 – January 7, 2018 at the Charles M. Schultz Theatre. Holiday shoppers can stroll through Ghost Town’s Christmas Crafts Village featuring dozens of local artisans selling their unique crafts and gifts. Also available in Ghost Town, inside the historic Bird Cage Theatre, Knott’s melodrama company brings to life Charles Dickens’ A Christmas Carol and O. Henry’s A Gift of the Magi. Performances available on select dates, November 17, 2017 – January 7, 2018. The Birdcage Theatre is also home to the toe-tappin’, hand-clappin’, comedy and bluegrass of Krazy Kirk and the Hillbillies who continue their Knott’s Merry Farm residency this holiday season on select nights.